Greetings fitness fans. 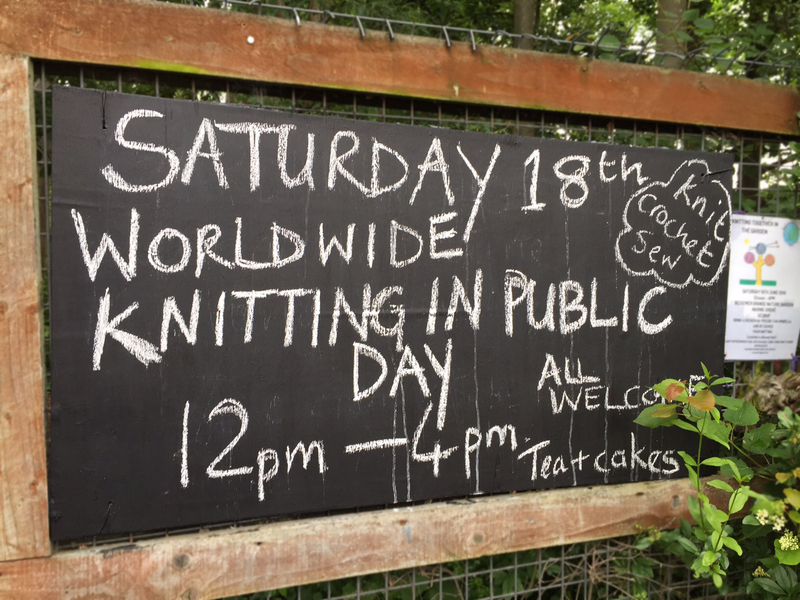 In recognition of today being International Knitting In Public Day we at Chegwins Gym are hosting a day of classes from Clare Balding’s highly successful Hit & Knit course. All classes will be held outdoors in the grounds of the cemetery next door (or inside the chapel of rest if it rains) and taken by acclaimed “black-belt” teacher Michael McIntyre and his new assistant Germaine Greer. Classes will start at 12 if Mr McIntyre can get his flatmate Mrs Greer get up in time. But come early as places are very limited and space between the graves quite tight. 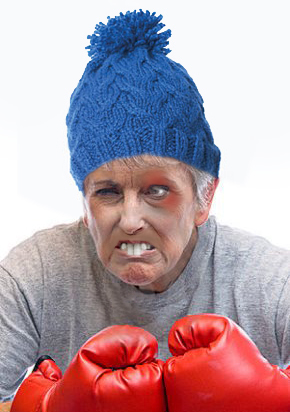 For the uninitiated the Hit & Knit franchise was started a few years ago by TV’s favourite horse-botherer Ms Clare Balding and seeks to give students of all ages and sexual persuasions a grounding in the mental, & highly physical, riguers of knitting combined with the keep-fit pummeling of boxing. Today’s one-hour “sample” classes cost £53 to attend (£43 for students and low-life on benefits) with enrolement for the whole Autumn course will commencing next month. For the less abled or lethargic we will also be laying on crochet, sewing and cake eating demonstrations. See you in the cemetery… Rod S. Welling, manager, Chegwins Gym. Greetings fitness fans. It’s time to limber up those knitting-needles and polish up your boxing gloves as August see’s the return of “our” highly successful Hit & Knit course. Started a few years ago by Beckworth’s very own “lady” TV tennis-commentator and horse-botherer, Clare Balding, the course seeks to give students a grounding in the mental & physical riguers of knitting combined with the keep-fit pummelling of boxing. Although inspired to start the classes by her heroes Eddie The Edwards Eagle and Amir Khan it was her own upbringing she drew on most as she comes from a bare-knuckle fighting dynasty. And her Great-Gran was a World famous speed knitter. In the past Clare has used Hit and Knit to successfully train the X-Factor judging panel, Prince George‘s nanny and the disgraced ex-presenters of Top Gear. In a new twist on the format, this year the course will run 24/7 for 4 weeks with all “inmates” living full-time in the gym changing rooms. Also, due to her busy schedule, Ms Balding has handed the course over to her good “friend” (and ex- Hit & Knit graduate) Michael McIntyre, ably assisted by Ms Clare’s very own Aunt Dolly. Places are limited so book early, and as the slogan says “before you can say Hit One, Purl One you’ll have made yourself a new sweater, with matching shorts, and be able to punch well above your weight. You’ll be a new you!” All sexes welcome, but it’s over 18s only. The whole course only costs £22,673 (excluding costs of materials, food and medical insurance). See you at the gym in August, Rod S. Welling, manager, Chegwins Gym. Starting Thursday at 7.30, Beckworth’s very own “lady” TV sports-commentator, and horse-masseuse, Clare Balding is once again running her famed Hit & Knit course in the gym. In a change to last year it will now be every Thursday and run for four months to give the trainees more time to conquer the mental & physical riguers of knitting combined with the keep-fit pummelling of boxing. Inspired by Mohamed Ali and her own upbringing (her dad was a scrap metal dealer and amateur bare-knuckle fighter), Clare has used Hit and Knit to successfully train The Army Wive’s Choir, UKIP councillors and the cast of Downton Abbey. Just think, before you can say “Hit One, Purl One” you’ll have made yourself a matching scarf, hat and gloves and be able to punch well above your weight. You’ll be a new you! All sexes welcome, but it’s over 18s only. The whole course only costs £3,800 (excluding costs of materials and medical insurance). See you Thursday. Rod S. Welling, manager, Chegwins Gym. Starting tonight at 7.30, Olympic athlete and horse-whisperer Clare Balding is once again running her famed Hit & Knit course in the gym. Running one evening per week for three months it combines the mental & physical riguers of knitting with the keep-fit pummelling of boxing. Inspired by the Rocky films, Clare’s used it to successfully train the SAS, Network Rail staff and the cast of Cats. Just think, before you can say “Hit One, Purl One” you’ll have made yourself a matching scarf, hat and gloves and be able to punch well above your weight. You’ll be a new you! All sexes welcome, but it’s over 18s only. The whole course only costs £2,600 (excluding costs of materials and medical insurance). See you tonight. Rod S. Welling, manager, Chegwins Gym.